It’s December 6th three years ago i gave birth to Freya and it still feel like a moment ago and now we are preparing our third time giving her moment to remember. Why moment? Because for me a birthday is a memoar of days left we enjoy to do something we need to fulfill in our life. And so does i see beyond her eyes, take care of her carefully to seize the moment and live the fullest. So this year as i was talked before since we both (me and husband) had so many deadline to catch that we wish we can release our project the next year we decide to go vacay somewhere near and not spend so much budget (our annual ritual). But before we do it we have very own request from the star itself. Well as now she has analyze everything around her carefully and start auto copy, we have to deal with her wish and request. We planned to make small celebration with a cake and family around just to make her happy and a little decoration as well. As i have my cousin as best party planner (you may see her profile and work here if you need help) i request whole thing i need for her small “cut cake” moment this year include cake, balon and everything but we will decorate ourselves (my husband actually did, i just watch and take photos. Ton of photos haha). All when smooth till few days before the plan come true my mom and sister insist me to cancel the plan according to believe that it’s not good to do this tradition as this is not islam proper. I accept the idea as a good thought, but i have ordered all things and it’s impossible to cancel all the preparation right away so i try to explain to let this year pass like before and start try to stop this blow candle next year, i have no hard feeling to do this or not. I just so calm, too calm until i realize the cake deadline was ordered not the day before but the exact day of date we expect to celebrate. I still remind calm until the day when we patiently waiting the decoration package and cake finished, they finished so late that day. 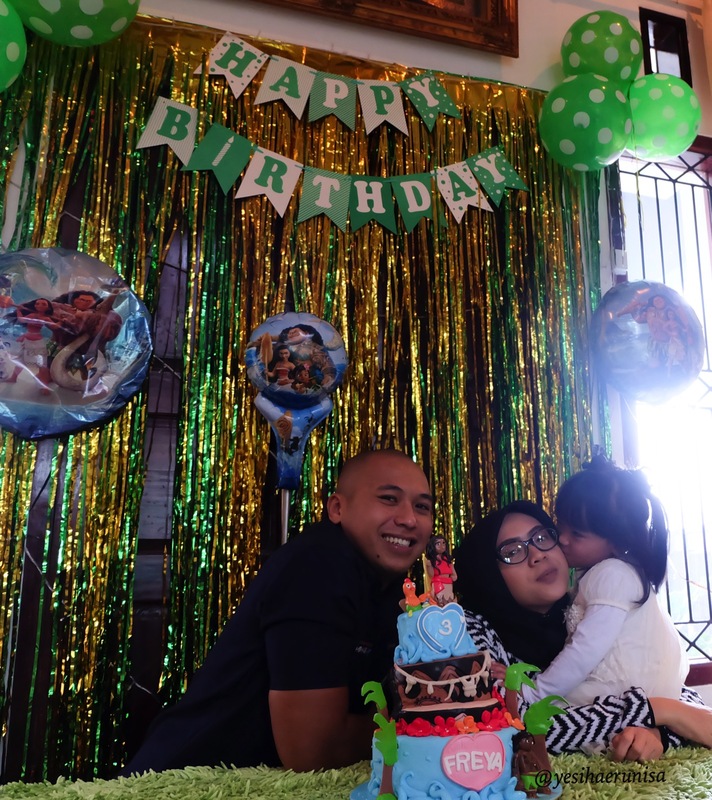 I calm myself to postponed the celebration to the next day as we can start decorate that evening and start to contact my sisters to send their kids tomorrow noon to accompany Freya blow the candle. Just right before we took the cake my cousin tell me in hurry that the figure on the cake is not look like Moana (she order to have Moana cake) my cousin remind me of her suggest to buy the action figure daaaaysss before that i refuse (what’s in my mind that day?). I totally forgot because of the amount of work lately, i feel guilt a bit for delaying my daughter’s celebration so directly that afternoon i order action figure and request it to send with one day service package. Okay i think all the problem has been solved and i just wait for tomorrow. BUT the next issue i have to deal is the package hasn’t been arrive before noon and after we check the (package) number it will arrive at night. Oh god after so exhausted of so many issue for my neglected attention into detail i just let the celebration begin. It turns out even my daughter and all the kids didn’t even notice thing bugs me the whole days. happy and being normal kid. your presence and her beloved person is the most valuable gift kid want on her day so make it count. One day when you read mom’s blog and laugh on how sloppy your mom is you have to believe that behind every worry i’ve been it’s the fear to not give you the best. Mommy love you abundantly. 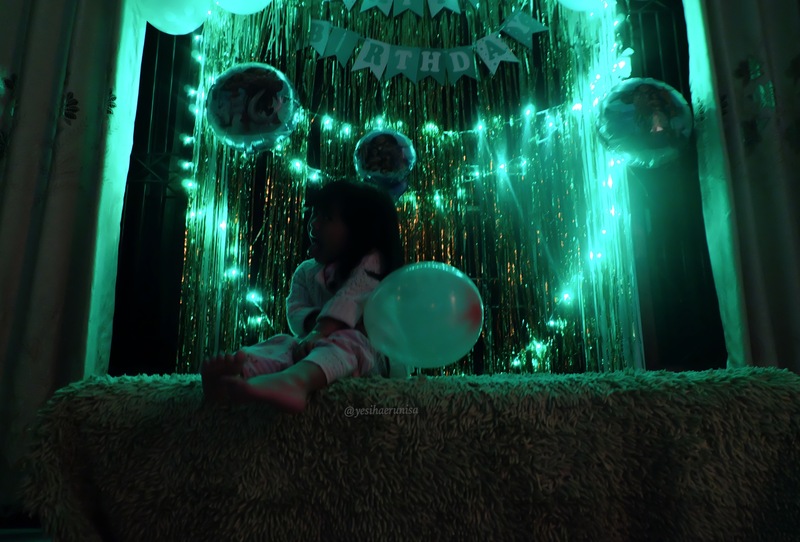 Happiest bday kiddo wish upon the star because you are our shining star.